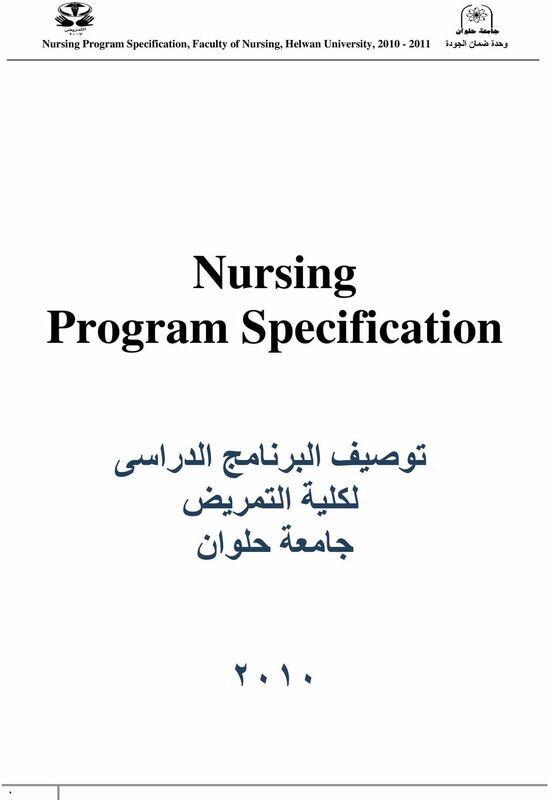 Download "Nursing Program Specification تىصيف انبش بيج انذساس نكهيت انت شيض جبيعت حهىا"
3 B- Professional Information 1- Programme Aim: 2 ة- يعهىيبث يتخصصت: 0- األهذاف انعبيت نهبش بيج: The aim of the program is to provide nursing students with the knowledge, skills, and attitude necessary to nursing care of individuals, families, and communities in health and illness at preventive, curative and rehabilitative level. 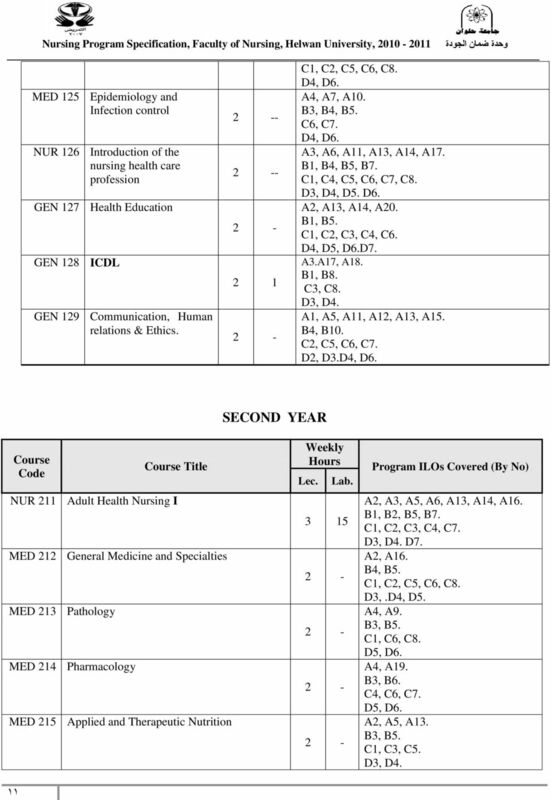 Baccalaureate Nursing program (B.Sc.) 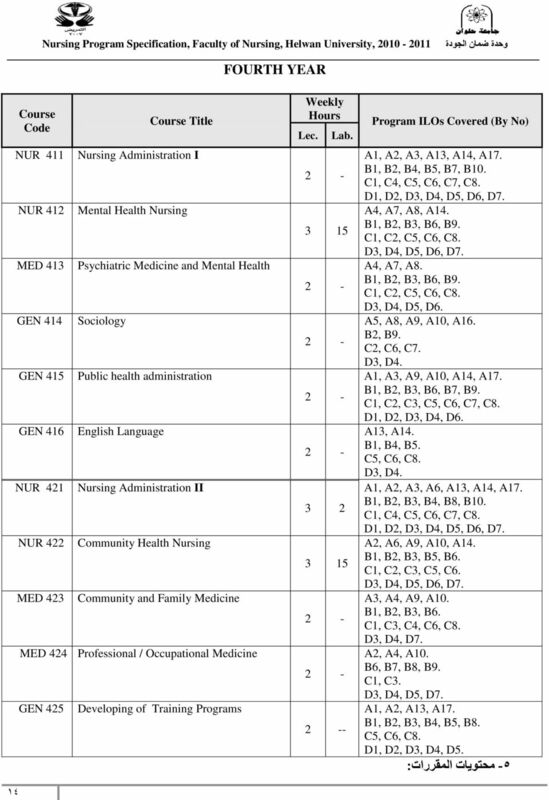 is focusing on: 1- Acquisition of knowledge, skills, and attitude relevant for nursing profession in the field of nursing education, practice and research. 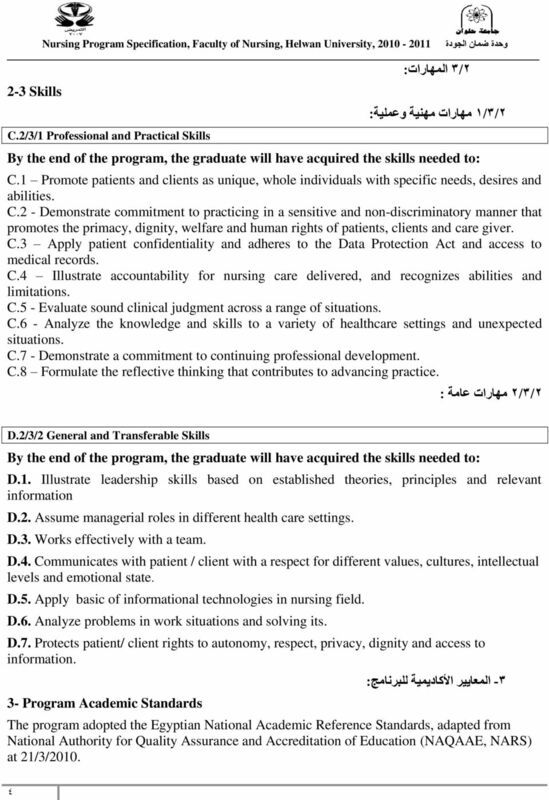 2- Prepare a professional nurse who possesses the knowledge, skills & attitudes to practice professional nursing in a variety of current health care delivery system. 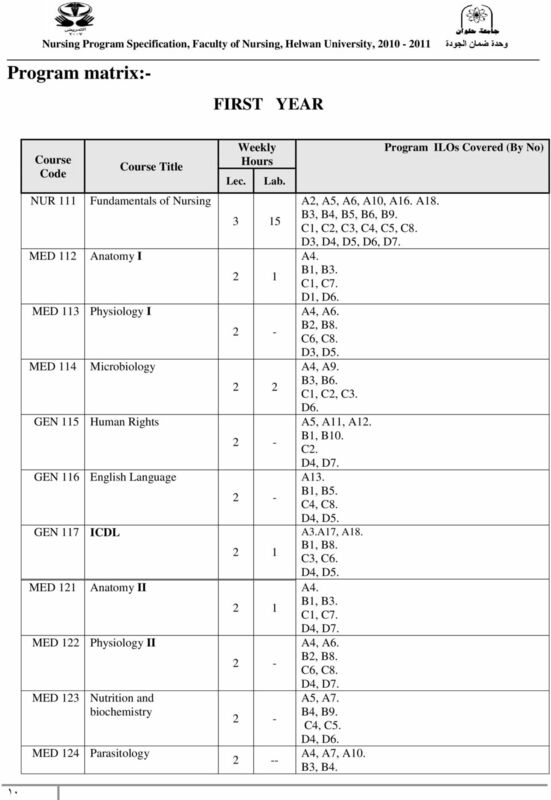 3- Acquire other personality traits such as; critical thinking, commitment and interdisciplinary work. 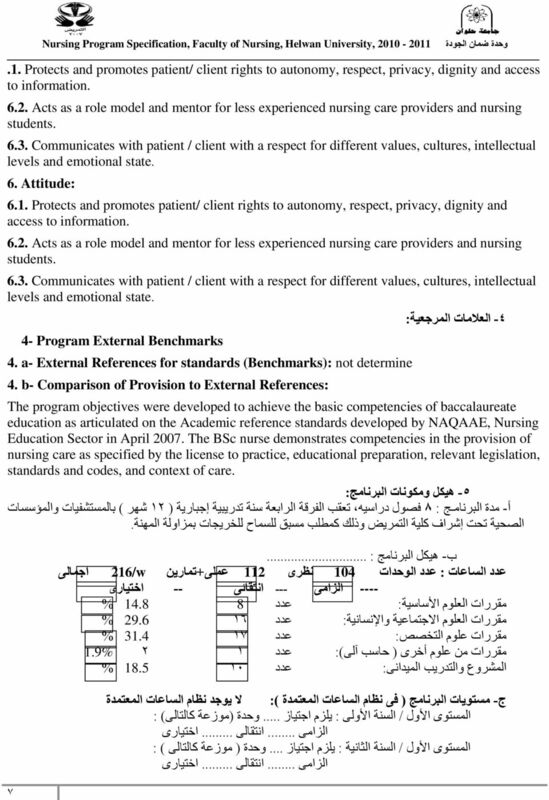 4- Collaborate with national and international nursing agencies to formulate standards, policies and regulations to improve nursing image. 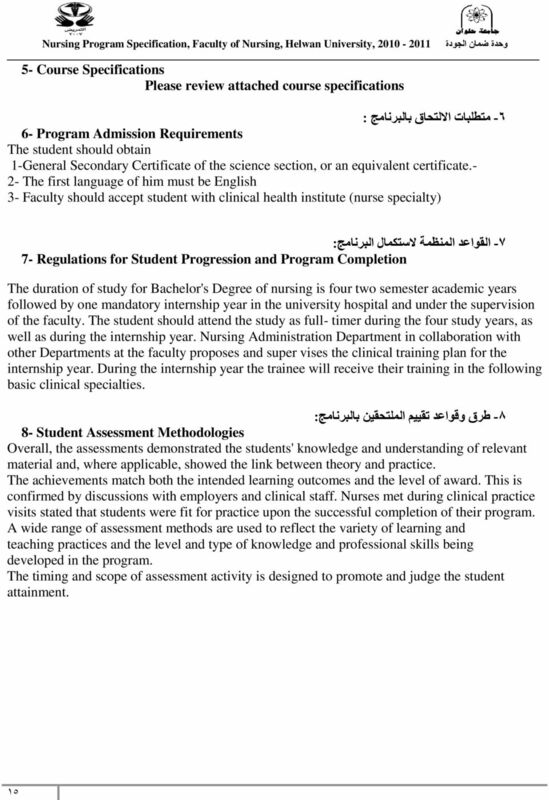 2- Intended Learning Outcomes of the Program: A. 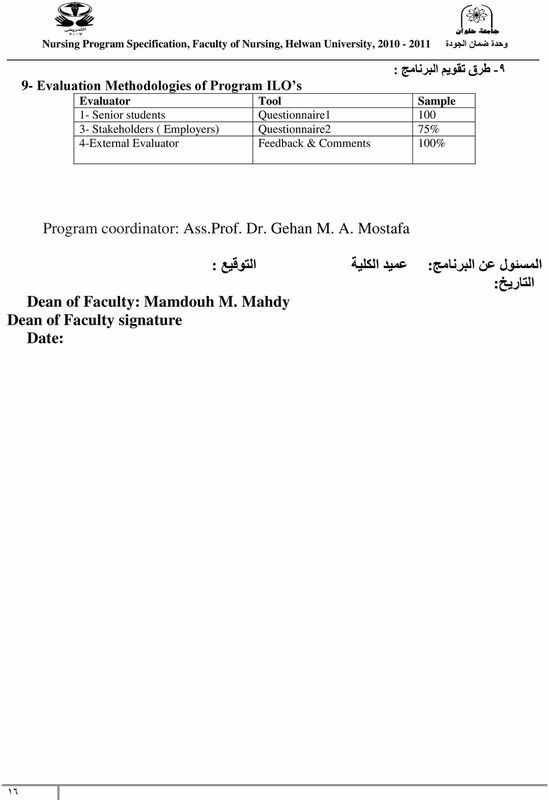 1/2 Knowledge and Understanding: 0- ان خشجبث انتعهي يت ان ستهذفت ي انبش بيج: 0/0 ان عشفت وانفهى: A.1. 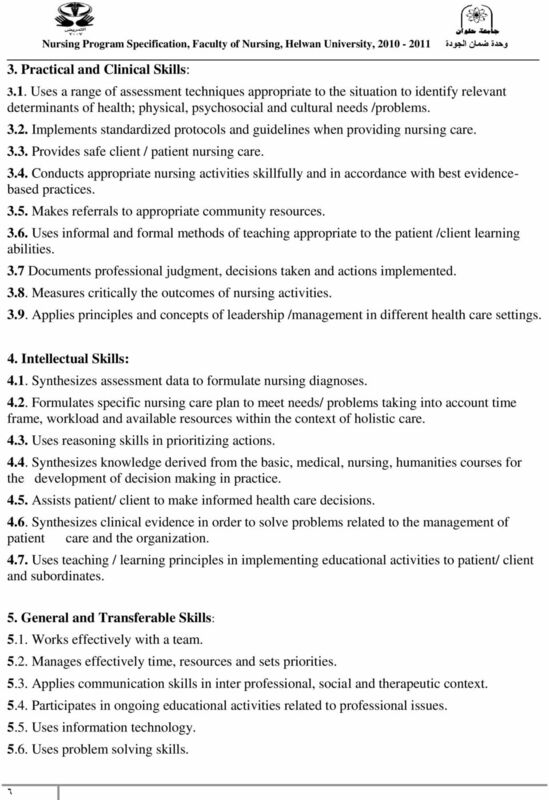 Delineates the basics of professional nursing issues e.g. advocacy, accountability, informed consent, autonomy, partnerships and collaborative working within the different clinical setting. A.2. 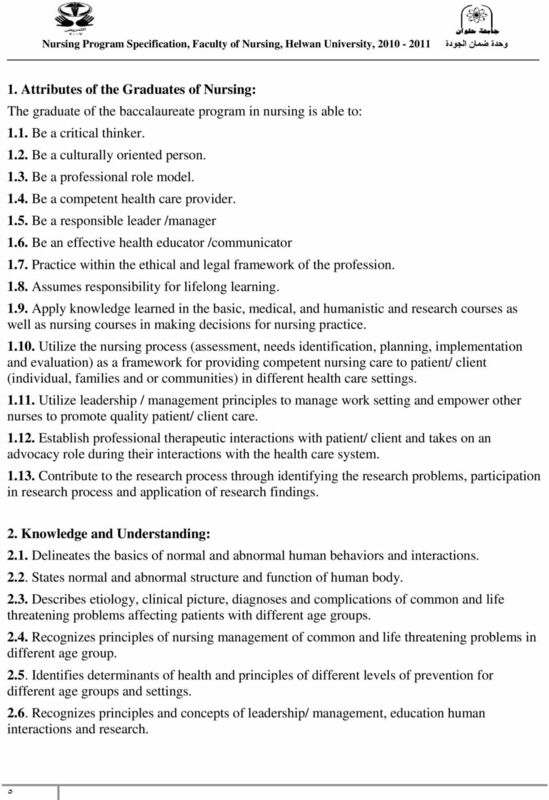 State nursing strategies for different patient needs. A.3. 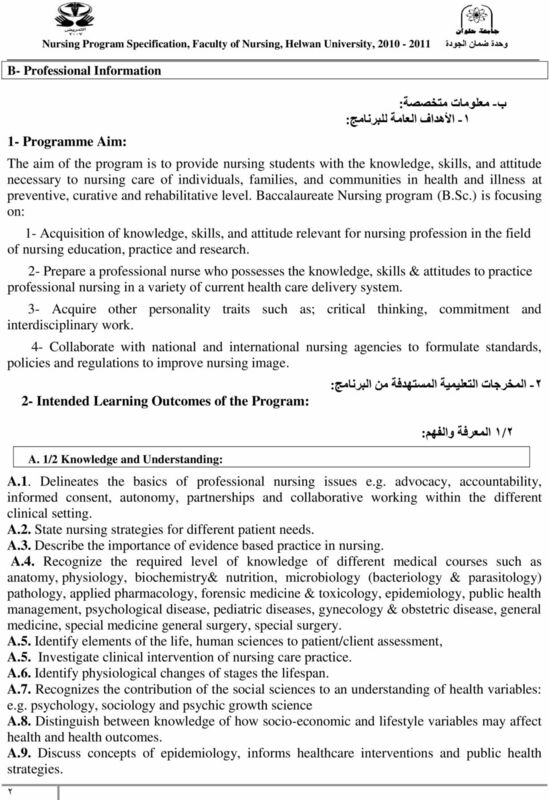 Describe the importance of evidence based practice in nursing. A.4. 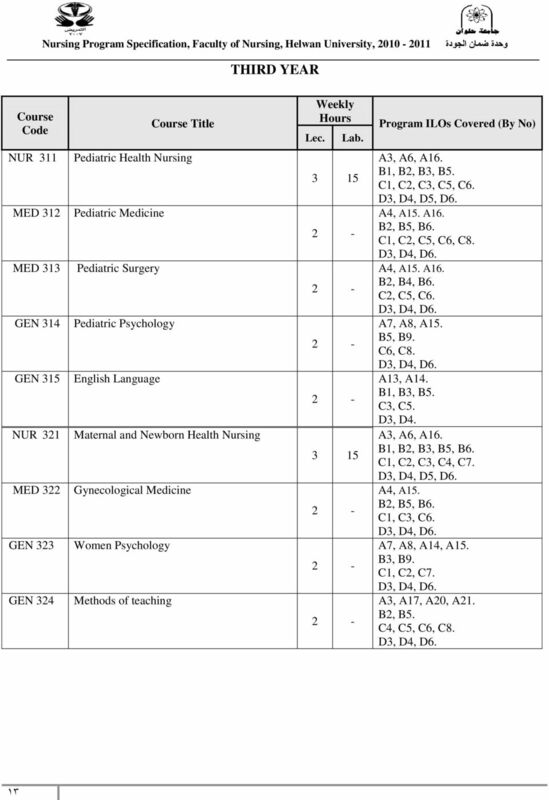 Recognize the required level of knowledge of different medical courses such as anatomy, physiology, biochemistry& nutrition, microbiology (bacteriology & parasitology) pathology, applied pharmacology, forensic medicine & toxicology, epidemiology, public health management, psychological disease, pediatric diseases, gynecology & obstetric disease, general medicine, special medicine general surgery, special surgery. A.5. 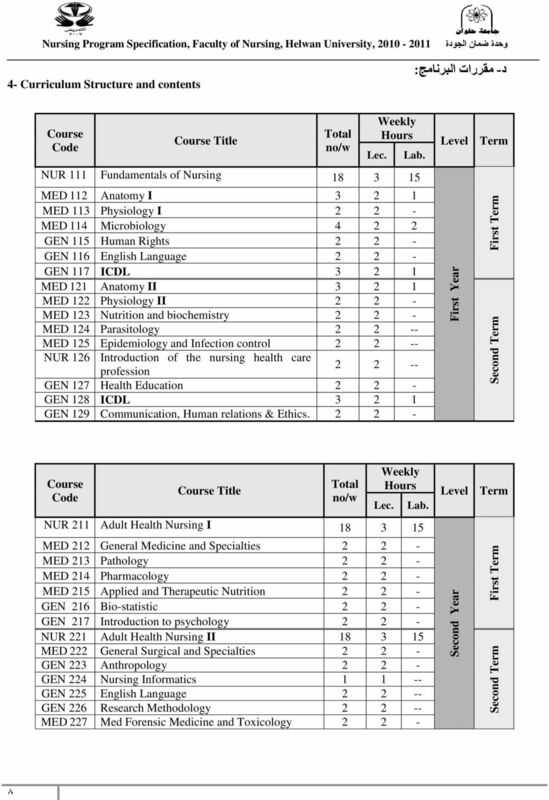 Identify elements of the life, human sciences to patient/client assessment, A.5. 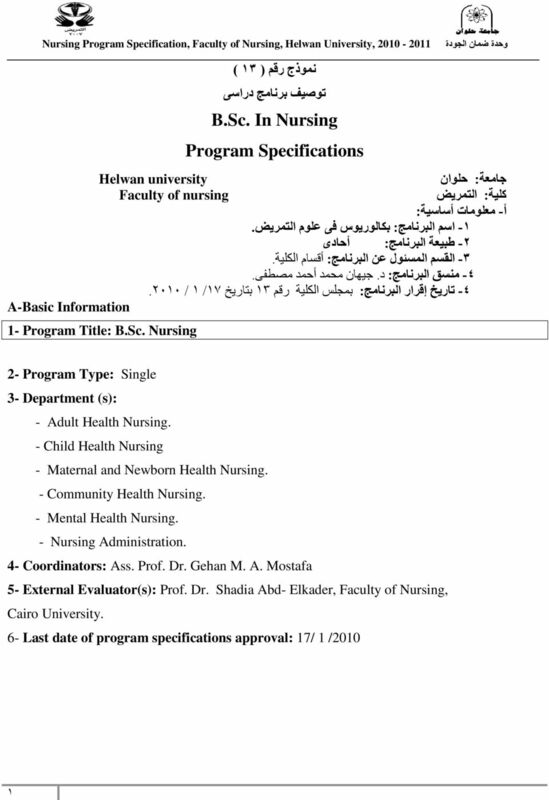 Investigate clinical intervention of nursing care practice. A.6. Identify physiological changes of stages the lifespan. A.7. 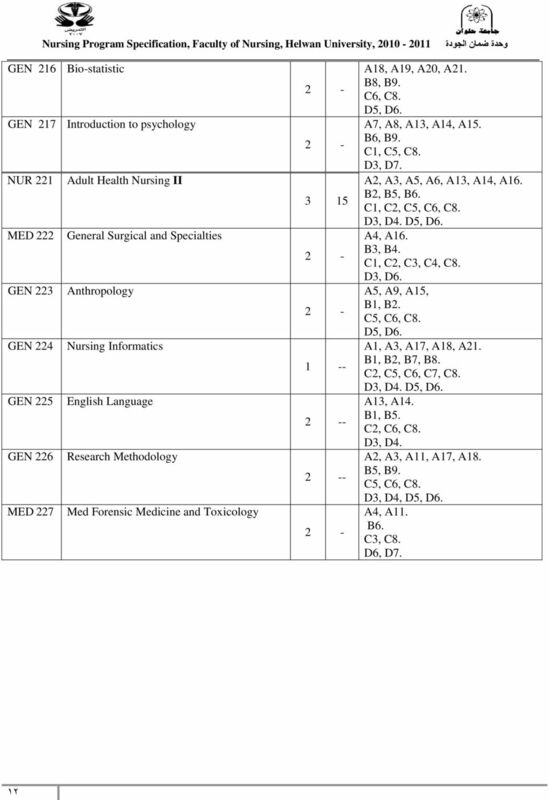 Recognizes the contribution of the social sciences to an understanding of health variables: e.g. 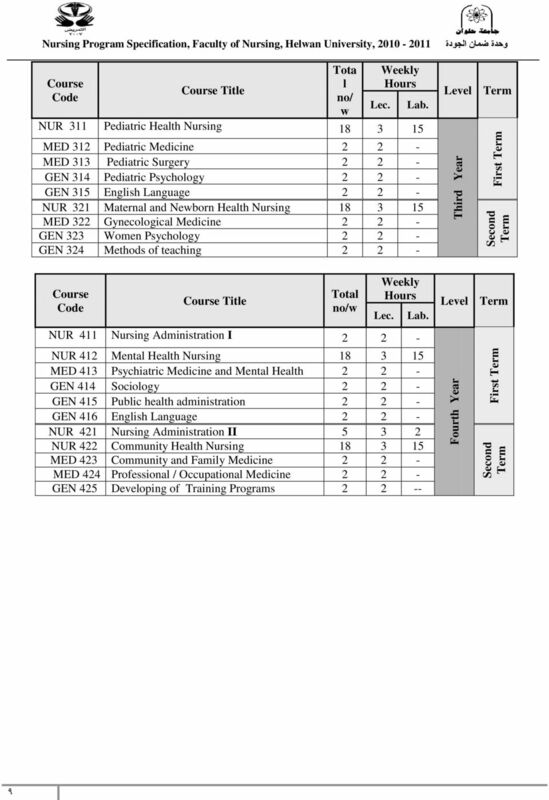 psychology, sociology and psychic growth science A.8. Distinguish between knowledge of how socio-economic and lifestyle variables may affect health and health outcomes. A.9. Discuss concepts of epidemiology, informs healthcare interventions and public health strategies. Goal 2. 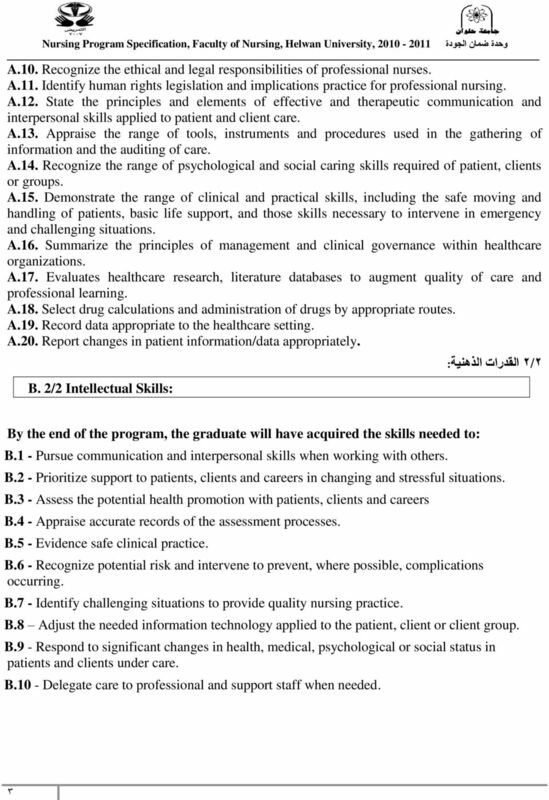 To produce humanitarian physicians with high moral and ethical standards.